The advancement of a successful model the linear imager LI2208 from Zebra is built upon the successful laser variant LS2208, yet it scores big with its additional capabilities. Among these are its reliable capture of nearly all 1D barcodes from paper labels and displays, an expanded scanning area and improved scanning properties. This combination makes the LI2208 a classic universal scanner for usage in retail, production, during check-in at hotels and many additional applications. The optional Intellistand even allows for the automatic switch between handheld and presentation modes. The LI2208 also supports the capture of concentrated barcodes - as are often found on small electronic parts. 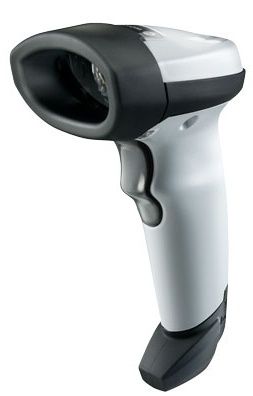 The variable scanning distance supports users during the quick and easy barcode capturing process. With 547 scans per second the LI2208 guarantees uninterrupted work and high throughput. The patented individual circuit board, the forgoing of plug-in connectors and flat ribbon cable, as well as its highly robust housing make the LI2208 a reliable scanner for challenging daily use.